Although likely an oral tradition passed along at campfires for quite some time, the first published version of the “some mores” recipe can be found in a 1927 handbook: Tramping and Trailing with the Girl Scouts. By now everyone knows the formula: crunchy cookie + melty chocolate + gooey marshmallow, charred with a bit of smoke. There’s plenty of variations on that theme... The candybar at Liddabit Sweets got me thinking about a sophisticated indoor version using Arbor Teas. Here, the cookie base is a toasted pecan shortbread laced with black tea, vanilla bean, cardamom, and anise, all care of Arbor Tea’s organic Thai Iced Tea blend. To invoke the requisite bonfire, a soft chocolate ganache layer is infused with their organic, smoked Lapsang Souchong. All is topped with a homemade marshmallow, singed by the flame of a culinary torch. Pulse flour, Organic Thai Iced Tea leaves, salt and pecans in food processor until finely ground. In a stand mixer bowl, beat butter with sugar on medium-high speed until light and fluffy, about 2 minutes. Add flour mixture to the butter and sugar. Mix on low speed until the dough starts to come together, about 1 minute. Cover bowl and refrigerate until firm, about 1 hour. Preheat oven to 350℉. Wipe muffin pans with softened butter. Press 1½ tablespoons of dough into each cup, packing firmly with the bottom of a juice glass. Bake until edges are brown, about 20 minutes. Let cool completely in pans on a wire rack before topping with smoked tea chocolate ganache (recipe below). Place chocolate and salt in a large bowl. Set aside. Combine the Organic Lapsang Souchong Black Tea leaves, heavy cream, and golden syrup in a small saucepan over high heat. Bring to a strong simmer, cover pan, and turn off heat. Allow tea to steep for 20 minutes. Strain cream to remove tea leaves and return it to the saucepan. Bring to a boil. Immediately pour over chocolate and let rest for 5 minutes before stirring. Stir gently for about 2-3 minutes until ganache comes together. In a small bowl sprinkle the gelatin over ¾ cup cold water and let dissolve at least 5 minutes. Add remaining ½ cup water, golden syrup, and sugar to a 4-quart saucepan. Stir until combined, then bring to a boil without stirring, until the mixture reaches “firm-to-hard-ball” stage, or 250° F on a candy thermometer. This should take about 10 minutes. Meanwhile, whip the egg whites until soft peaks form. Once the syrup reaches the necessary temperature, pour it down the side of the bowl into the whites while the mixer is moving at low speed. Next, add the softened gelatin and turn up the speed of the mixer to high, continuing to whip until stiff, thick and almost tripled in volume. Beat in the vanilla extract. Quickly spread the marshmallow cream across a large sheet pan lined with a piece of buttered parchment paper. The marshmallow should fully set in about 30 minutes. Cut out desired shapes and roll the marshmallows in powdered sugar to prevent sticking. Working quickly, pour one heaping tablespoon of warm ganache on top of each cooled biscuit while still in muffin cups. Shake the pan from side to side and tap lightly on counter to level the ganache, and then press a marshmallow into the center of each. Allow ganache to set until firm, about 1½ hours. Loosen s’mores from pans with a small offset spatula. 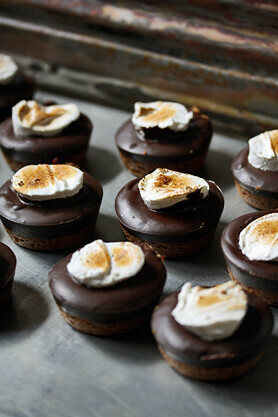 Torch the tops of marshmallows with a small culinary torch or under a broiler before serving.